For well over a century, innovation, quality and service have defined J.L. Clark as one of Rockford’s premier manufacturers. 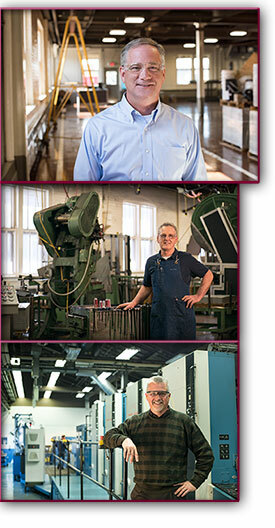 Originally in the hardware business, the Clark family established J.L. Clark Mfg. Inc. in 1904 when John Lewis Clark invented the Gem Flue Stopper, a device used to plug the hole in a wall left behind from stovepipe removal. More than 1,000,000 Gem Flue Stoppers were sold between 1904 and 1919. Exemplifying an ingenuity and efficiency that resonates to present day, J.L. Clark Mfg., Inc. developed a process for re-purposing the left behind scrap metal into tin pill boxes and ointment tins. A by-product of Gem Flue Stopper production - more than 1,000,000 units were sold from 1904-19 - the left behind scrap metal was re-purposed into tin packaging for pill boxes and ointment tins, exemplifying an ingenuity and efficiency that resonates to present day. Today J.L. Clark is a global leader in highly-decorated tins, a diversified packaging business long known for its presence in the world of spices. Wherever you see McCormick brand spices in tin packaging—in aisle five at the grocery store or in your kitchen cupboard—you experience J.L. Clark’s packaging excellence. “You have something in your house right now from J.L. Clark and you don’t even know it,” says Phil Baerenwald, president at J.L. Clark since 2001. In addition to spice, J.L. Clark is embedded in other markets including health and beauty aids, batteries, and confection. The company’s capabilities also include custom injection-molding, manufacturing plastic packaging for products like Hershey’s Ice Breakers mints and Burt’s Bees lip shimmer. J.L. Clark is headquartered at 923 23rd Avenue on the south side of Rockford, the same location it’s been in since 1911. Today, the Rockford facility operates with approximately 240 employees, including front office personnel, machinists, and even an in-house art department tasked with translating customer concepts into reality. In 1955, the company expanded to a second location when it acquired Lancaster, PA-based Liberty Can and Sign Company, which has helped to maintain a strong presence along the east coast. J.L. Clark's family environment continues to be passed along through its staff, some of whom are in their fifth decade of employment with the company. Trust is a critical element of the company culture as associates are relied upon to provide superior service in an extremely dynamic consumer environment. To remain competitive in today's market, J.L. Clark differentiates itself through innovation and automation. The company's success is evidenced not only by customer satisfaction and loyalty, but also by its receipt of several prestigious awards: Rockford Chamber Manufacturer of the Year 2011, the Illinois Governor's Sustainability Award for four of the last five years, and recognition by the International Metal Decorators Association (IMDA) for "Excellence in Quality."